Amalfi Transfer carries out its rental service with driver (N.C.C.) on the Amalfi Coast. The Amalfi Coast is a lovely place to spend your stay. The magnificent views meet with good food and allow all guests to spend happy and peaceful days. If you are staying in Naples or Sorrento or in nearby Salerno, Amalfi Transfer organizes tours and excursions, even for just one day, to take you to admire the beauty of this land. We organize transfers from Naples to the Amalfi Coast to admire Amalfi, Ravello and Positano. Tour of Pompeii from the Amalfi Coast to visit the most importantly archaeological site. It is possible to add to the itinerary of the excavations of Pompeii, also the visit of Ercolano and the villa of Poppea to Oplonti. We can accompany you to discover the countless beauties of Naples with our tour that takes you to the symbolic of the city. Food and wine tours for those who want to taste typical products, such as mozzarella and real Neapolitan pizza. Other interesting tours and excursions are the visit of Paestum, rich in Greek-Roman history with temples and museums. The visit of the Royal Palace of Caserta, the largest royal palace in the world by volume, owned by the Bourbons of Naples. This is just a brief summary of what our land has to offer its guests. We invite you to visit the other sections of our site to discover and explore all the services we offer. In the “Our guests” section you can see the joy and satisfaction of those who have already chosen us and have spent pleasant moments on the Amalfi Coast and in Campania. The Amalfi Coast offers panoramas with multiple nuances and particular flavors in each month of the year. Having the opportunity to plan your vacation, our advice on the best time to visit is certainly from April to June. In these spring months, the colors and smells of flowering terraces explode, the sun starts to get hot. You can give yourself the first dive into the sea, an excursion on the various mountain trails or a pleasant walk in the coastal villages. May and June are best months ever before the oppressive heat of summer and the many tourists from around the world. The spring on the Amalfi Coast is very pleasant: one recovers from the winter just ended, the tourist facilities and activities reopen and you can enjoy a peaceful stay. After Easter officially begins the tourist season that lasts until the end of October. The high season months are certainly July and August. If you love nightlife and parties, keep in mind that most of the events take place in these months. There are numerous discotheques on the sea such as the Music On The Rocks in Positano and the African in Praiano. 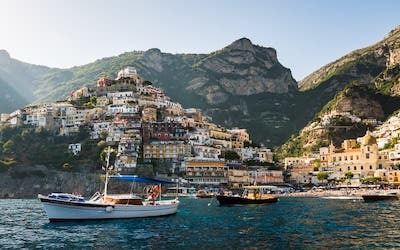 The Amalfi Coast is becoming an increasingly popular destination for celebrities who choose our places to enjoy moments of relaxation and vacation. Even during the high season it is however possible to enjoy moments of peace and solitude, with the possibility of renting a boat or hiking on the various mountain trails. The Valle delle Ferriere is an excursion that cannot be missed for nature and mountain lovers. Along the way, you will find ruins of ancient paper mills and ironworks as well as waterfalls and streams of icy water that offer a wonderful spectacle and keep you cool, even during the hottest hours. The Path of the Gods is also very famous, winding along the entire Amalfi Coast, for a distance of 10 km, and starting from Agerola it reaches Positano, embracing several coastal towns. It is considered one of the most beautiful trails in the world, thanks to the scenery and views that can be enjoyed along the way. For those who prefer a sea excursion, there are several boat rental services. Thanks to this experience, you will be able to discover the hidden coves along the entire Amalfi Coast, access characteristic restaurants and admire all the details of the small villages overlooking the sea. The main excursions are the cave of the emerald, which owes its beauty to the light that, penetrating through the rocks, gives fantastic chromatic effects and to the underwater crib. The fjord of Furore, a deep crack in the rock whose walls fall sheer to the sea, and finally Capri with its stacks, caves and small bays. September and October are two other interesting months for a vacation on the Amalfi Coast, as the days are still warm, you can enjoy a dip in the sea without the crowds of tourists of the previous months. Being low season the prices are lower and lower. During the winter the cold becomes slightly pungent between the months of January and February, without ever being excessive. Countries are preparing for Christmas holidays and the streets are decorated with Christmas lights. The winter months are certainly less hectic than the summer months and you can enjoy a quieter stay but it is good to know that many bars and restaurants close during this period and also the main activities and attractions are not operational at full capacity. Characteristic of the winter on the Amalfi Coast are the sea storms, which break on the cliffs and on the beaches of the various cities, during weeks of intense rain.